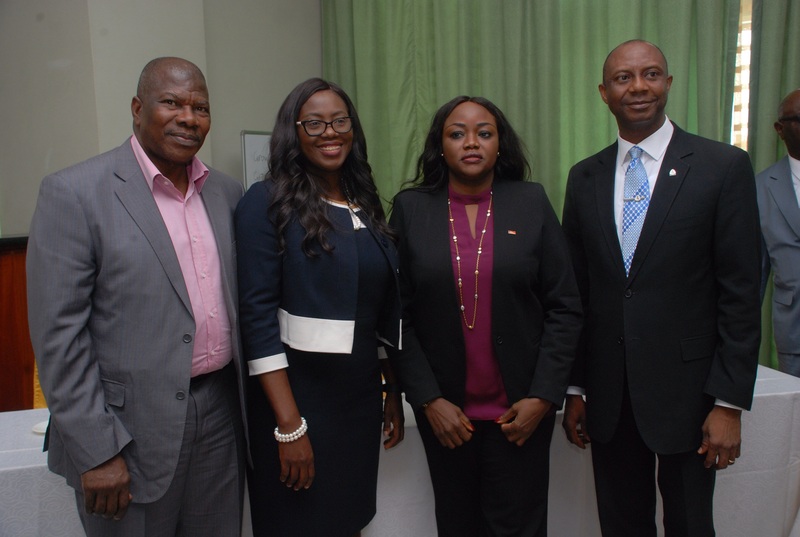 From left: Deputy Commissioner, Technical, National Insurance Commission, Thomas Sunday; President, Chartered Insurance Institute of Nigeria, Mrs Funmi Babington-Ashaye; Managing Director, Financial Institutions Training Centre, Dr. Lucy Newman and Managing Director, B. Adedipe & Associates, Dr. Biodun Adedipe at the event. AN ADDRESS BY MRS. FUNMI BABINGTON-ASHAYE, FCII, FIIN, PRESIDENT AND CHAIRMAN OF COUNCIL, CHARTERED INSURANCE INSTITUTE OF NIGERIA DURING THE INSTITUTE’S BUSINESS OUTLOOK SEMINAR ON TUESDAY, 20TH FEBRUARY, 2018 AT LAGOS ORIENTAL HOTEL, VICTORIA ISLAND, LAGOS. 1. I am most delighted to welcome you all to our Institute’s seminar on Nigeria’s Business Outlook which the Council graciously initiated not only to beam searchlight on the economic and business issues that are likely to engage most captains of Industry and other business leaders in the new business year but also, to provide opportunity for our members to enrich their knowledge of happenings in their environment. 2. Without doubt, the outcomes of previous editions, have considerably assisted our members to proactively address emerging challenges with great success. It is this feedback that has encouraged the Council to press forward with this initiative. 3. The theme of the 2018 edition of the Business Outlook is: “Economic Policies of the Government in 2018: Issues, Challenges & Prospects for the Insurance Industry”. This year’s edition promises to be remarkable considering the calibre of resource persons selected to make presentations on various aspects of the 2018 Budget estimates and other fiscal policies of the government. The programme circulated has their names and enviable profiles. I commend them for agreeing to partner with our Institute on this noble cause. 4. Although I am required to just give a welcome address, permit me, this opportunity to briefly share my random thoughts on the subject of discourse as part of these my preliminary remarks. 5. The 2018 Budget of Consolidation was designed to build on the achievements of the 2017 fiscal year in which Nigeria strategically exited economic recession. To further spur on economic activities, the government plans to spend N8.61trillion while its expected revenue from all sources was estimated to be N6.60trillion leaving a funding gap of N2.01trillion. Thus, the budget 2018 is largely a deficit budget implying that the government will need to borrow from local and international institutions to augment the expected shortfall in budget. 6. Given that government borrowing is risk free, financial institutions might be more inclined to lend to the government than the organized private sector. Inevitably, the private sector may borrow at a higher interest rate to finance their activities. If this happens, their cost of doing business will rise and this might affect the prices of goods and services. Secondly, it is common knowledge that higher interest rates imply lower borrowing and investments. With lower investments and decline in economic activities, the demand for the non-compulsory insurance products may be negatively affected. However, we cannot say, the extent of this impact. 7. Distinguished guests, ladies and gentlemen, the 2018 budget is not all about negative impact. The point must also be made that if the current price of crude oil, Nigeria’s main source of revenue, is sustained all year round, the need for borrowing by the government may reduce. This is based on the fact that the budget was predicated on US$45 per barrel whereas, the price since the beginning of the year has been above US$60.00. With higher revenue, Nigerians should expect better implementation of the budgetary provisions. 8. Secondly, considering the fact that the government has allocated N181.19billion to the payment of pensions and gratuities of public servants while N15billion has also been set aside to meet MDAs’ life assurance premium obligations, the insurance sector should experience increased business momentum. On the whole, the Insurance industry, in my view, has more to cheer from the budget. In other words, the business outlook for the Insurance industry is mixed but very promising. As players and risk managers, we need to open our inner minds and take those business decisions that will help us reposition of industry in the unfolding 2018 business year. 9. Distinguished guests, ladies and gentlemen, let me end these remarks by, once again, welcoming you all this session which promises to be very interactive and knowledge driven. I hope I have raised some issues which our invited experts may assist to put across more appropriately as I am insurance professional and not an economist. I thank our distinguished guests and members for taking out time from their busy schedules to be part of this great programme. 10. Thank you all for your attention and God bless. CHARTERED INSURANCE INSTITUTE OF NIGERIA.